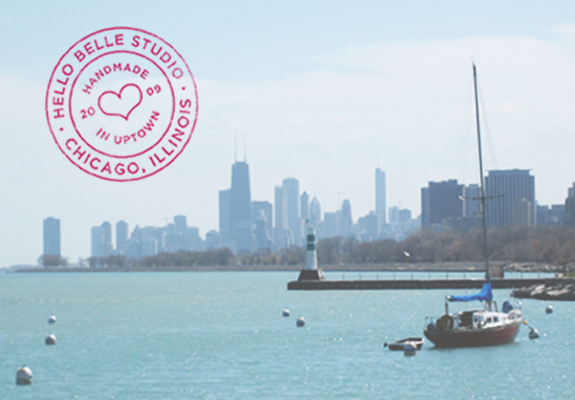 This week, we highlight the designer of our Neighborhood Guide, Isabelle Pantazis of hello belle studio. We enjoyed working with Isabelle throughout the process, and we hope you enjoy her creative vision as much as we do! Even before pursuing graphic design as a career, Isabelle has always had a passion for creativity. From “making collages from magazines to taking photographs as a child,” she often used her work to express herself and others. In school, she studied Fine Arts with a concentration in graphic design. Still, much of her expertise has come from on-the-job training. “For over ten years, I’ve had the privilege of working with a wide variety of clients in an even wider variety of media,” she says. Gaining experience in many areas of graphic design, from “branding and logos to web and print,” Isabelle has worked to develop her own beautiful aesthetic. In her spare time, Isabelle loves walking her 90-pound Mastiff, Fiona, along the lakefront trail, gardening, cooking, collaborating with other artists, and exploring the neighborhood. She enjoys extending her passion and skills to the community by attending local events with a focus on community building. Her weaknesses include a collection of beautiful vintage cookbooks and the savory goodness of Carmella’s chorizo tacos. When taking on new projects professionally and personally, she “believes in being open to new opportunities, noting, “you never know who you’ll meet or what you’ll learn.” We couldn’t agree more. Through helping businesses develop and share their brands and ideas, the studio seeks to “make a positive difference” throughout the community. Isabelle founded her own studio in 2009. hello belle studio was founded “to visually share the stories of entrepreneurs, small businesses, creatives and do-gooders.” They operate under the notion that “design is not a one-size-fits-all approach,” and they are careful to “take the time to get to know you and your audience” when designing. For small businesses, “each project is a handcrafted visual solution to turn your business goals into a reality.” The studio’s aesthetic seeks to capture the beauty in both details and simplicity through “good, old-fashioned hard work.” Through helping businesses develop and share their brands and ideas, the studio seeks to “make a positive difference” throughout the community. Isabelle and her husband chose Uptown “for its spacious dwelling options, rich cultural and architectural history, public transit, and proximity to the park and beach.” When describing Uptown, Isabelle exclaims, “It’s a hidden gem! We’re happy to be a part of this ever-evolving neighborhood.” There is much to be proud of in the community. “From the farmers markets and entertainment district to the local restaurants and unique businesses popping up,” Isabelle has noticed that Uptown possess a certain “positive energy” shared by many residents. As a small business owner in Uptown, Isabelle notes how “small businesses provide long-term health and well being to the community.” Through their constant innovation and neighborhood branding efforts, the neighborhood’s “unique, one-of-a-king businesses help keep our local character alive.” Through her own studio, Isabelle aims to “help energize small businesses to push themselves forward with a little design,” and help them “share their story.” When asked about her favorite aspect of the neighborhood, she says, “It would be the deep-rooted sense of community. I am surrounded by a diverse group of neighbors who truly care about this neighborhood, its history, and its future.” These residents and businesses are what make our community such a unique place to live, work, and play.